Let me start with saying that I tremendously enjoyed reading this book, I'd love to read it again. The delicacy of Teju's writing is inspiring and impressive. I'd love to write like that. This book reads like a journal entree about a young man who visits Nigeria after living in the USA for over a decade. His first entry starts with how he already started feeling the stress and pressure of Nigeria at its embassy. In order to have things done and on time make sure you have a box full of money! And that is only the beginning of what he has to tell us. you are extremely rich, of course. I do not want to give the impression that life in the west is all rosy, however, there are many things we tend to take for "granted" here and in places like Nigeria it is just a struggle, for instance; electricity, clean water and social services aren't just fundamental. I know the risks of noise pollution but try to explain that to a Nigerian who has his generator on full blast. By the way, with regard to this topic below is what a friend of mine recently posted on his Facebook profile a week ago and I'd like to share with you. Everything has changed! I have to put in twice the effort daily to achieve what I would have gotten ordinarily 2 years ago. The hike in dollar has made business a very laborious means of survival in Nigeria. You need to see the disappointment in the faces of your customers as u tell them yet again that the price of the item he/she bought last week has increased subtly or erroneously today. Well I had to lay off a few brothers and I had to replace them with my self, now I do more Job than I did days before .. I come home dripping and drenched in my own sweat, I quickly take a shower and pick up my son so that we can enjoy some precious time together. I still try to do things normally but "body no be firewood" The stress kicks in , fatigue and sleep will have to struggle with me as I try to keep my eyelids open just to see Wolf and Amanpour then I lose the battle and fall asleep. My body needs that sleep but my sleep is SHORT lived. At exactly 5 am, I am awoken by the blaring of sirens, I am startled , cursing and muttering under my breath wondering what the Popo could be doing on my street so early and depriving me of sleep, I wait patiently and realize it's not the Police, it's my brother from the Lord's Chosen Charismatic whatever!!!! He couldn't sleep? He came to preach about ladies in trousers, ill gotten wealth, ladies on weaveon's in fact he woke me up for nothing I tried to see reason with why he woke the entire neighbourhood up I couldn't! So I went downstairs straight to him and seized the Public Address System, he struggled a little with me but I came out victorious ... Finally I slept ... We should do something about noise pollution and the nuisances that perpetrate it. Another important aspect of this book is how many Nigerians have accepted "corruption" as an integrated part of their society to the point that it isn't offensive any more. However, what is forgotten is that it robs many of their right to a decent living, forcing them to turn into area boys, yahoo yahoo, armed robbers and resort to street harassment, jungle justice, it even do away with innocent lives by simply leaving the fire department with no water, and they can only watch as the plane incinerates its passengers, school children in this case. I'd highly recommend this book to be read in high schools across Nigeria, it depicts its current state of affairs. I look forward to reading more from Teju Cole. Absolutely. This book is an awesome travelogue. I got a vivid picture of Nigeria/Lagos and good commentary of the state of affairs after reading it. Hi Darkowaa, this was really a good read. I'm glad we agreed. I just finished reading the book today and thought it was a good read as well. Great review. Yes, it is a good book. 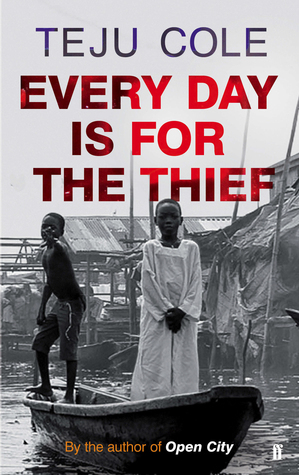 I just finished Teju Cole's Every Day is for the thief. I came to check for your review on it. I didn't enjoy the book at all. It was like a BBC reporter doing a documentary on Lagos. My own Lagos doesn't look that way at all. Perhaps much changes have occur. Teju Cole will be better as an American author. I think at some point, he made me understood that he considers himself an American writer. You might not like the content of the book, however, I must say that his prose is lucid and delicate.